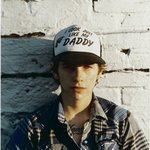 Is this the original frame? Yes! That is the original frame. Georgia O'Keeffe designed it herself. I like the way the frame's scallops echo the shapes of the clouds and the mountains. 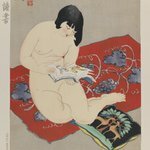 Did she often design frames to go with her work? No, we only know of a few cases where O'Keeffe did this. 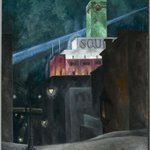 She may have been learning from other artists in her circle, like John Marin and Arthur Dove, who frequently designed frames for their own art. Great question! 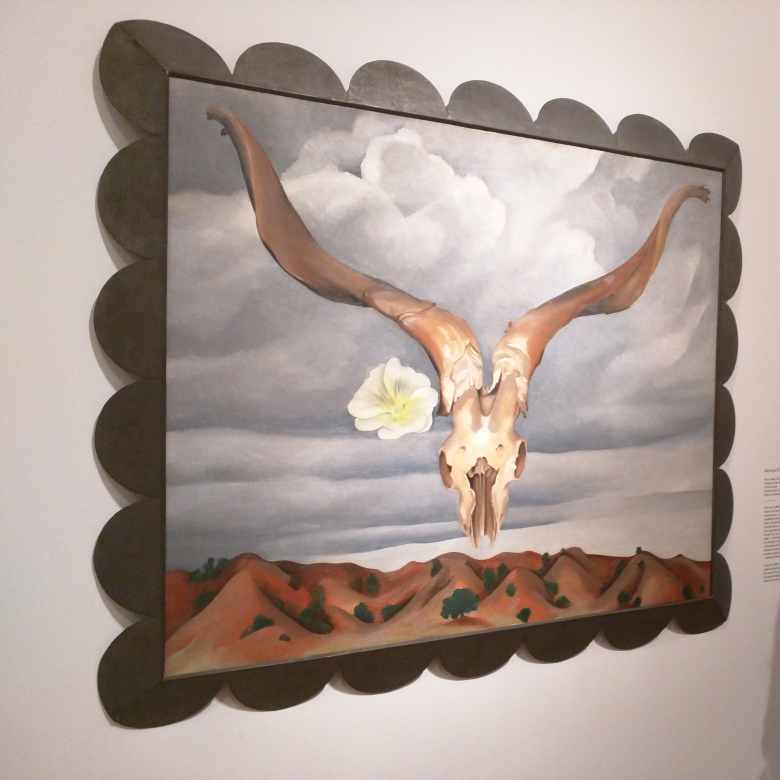 O'Keeffe would collect bones, rocks and other findings from her walks in New Mexico for these paintings. This is a really evocative piece. She was very adamant about not explaining her work to other people and she didn't like to discuss what different things symbolized in her art. So, you're free to make your own interpretations. I always wondered what she was all about. It seems she was serendipitous with object selection. And why not! I agree! Very serendipitous! 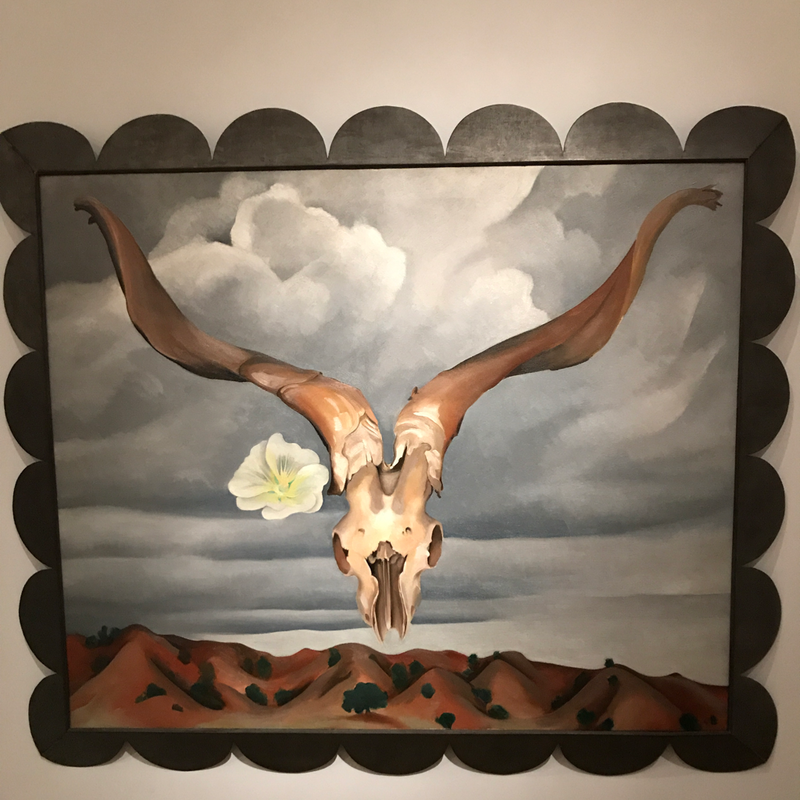 Here is a quote from O'Keefe about her first trip to New Mexico: "The first year I was out here, because there were no flowers, I began picking up bones...So I brought home the bleached bones as my symbols of the desert. To me they are as beautiful as anything I know. 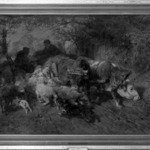 To me they are strangely more living than the animals walking around—hair, eyes, and all, with their trails switching." 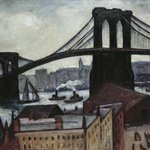 Did Georgia O'Keeffe start painting her iconic skulls and flowers and nature paintings after leaving New York? 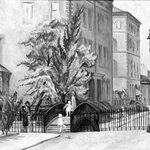 Or did she start painting these images while still in the city? She did start painting painting those iconic skulls and flowers while still living in New York. 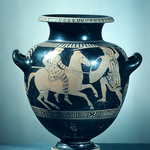 She began traveling to New Mexico and bringing back objects that she would then paint in her New York City studio. 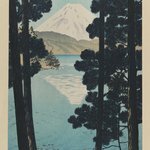 Ultimately, O'Keeffe was so drawn to her subjects that she permanently relocated there. Georgia O'Keeffe moved to New Mexico in 1949 following the death of her husband, the photographer Alfred Stieglitz, in 1946. 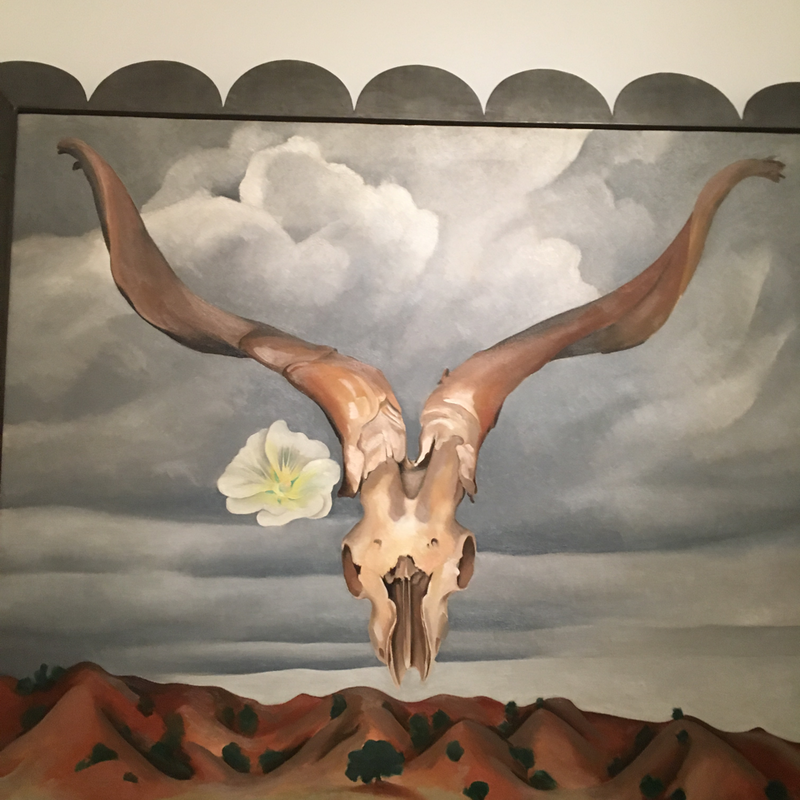 You can see an early skull and flower painting, "Ram's Head, White Hollyhock-Hills (Ram's Head and White Hollyhock, New Mexico)," from 1935 in a nearby gallery! 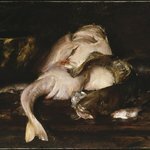 I saw the other paintings! is she originally from New Mexico? Great! Georgia O'Keeffe actually grew up in Wisconsin. It's no New Mexico, but certainly far from big-city life. Throughout her life, O'Keeffe lived all over the US. She studied in Chicago and New York; taught in Virginia, South Carolina, and Texas. 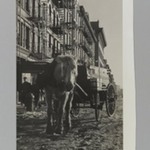 She lived in New York with Stieglitz and ultimately owned two homes outside Santa Fe in New Mexico. 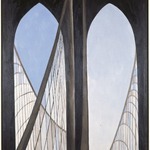 This work is by American artist Georgia O'Keeffe. She's most famous for her sensuous paintings of flowers and for works painted in the American Southwest. 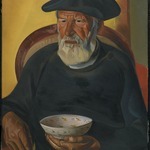 O'Keeffe was among a group of artists who strove to develop a uniquely American identity in the arts through emphasis on native subject matter, the modern urban experience, progressive means of representation (often resulting in abstraction), and spirituality as expressed through pure color and form. 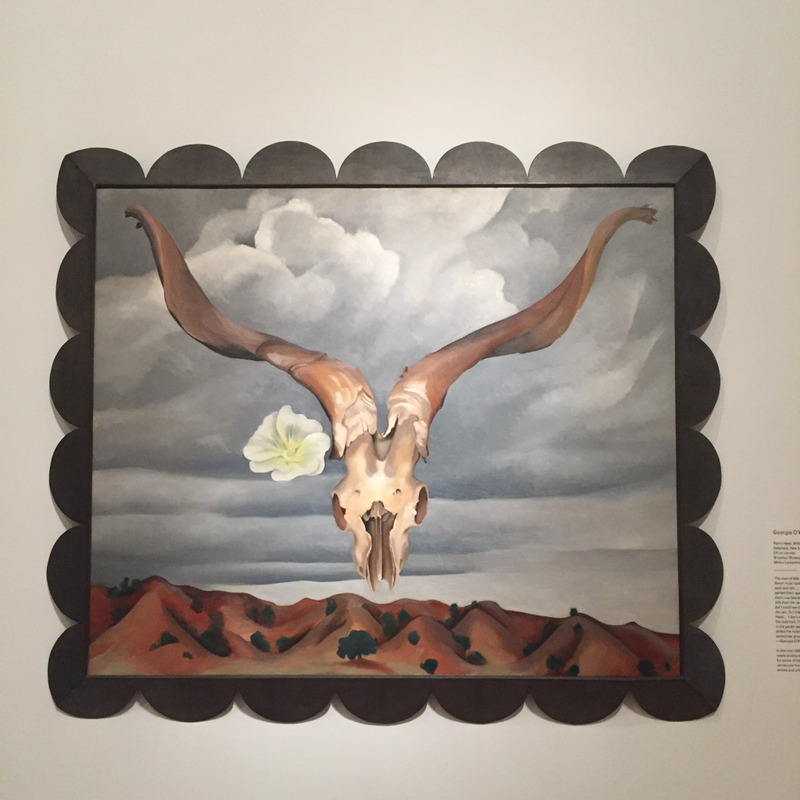 During her visit to New Mexico, O'Keeffe collected animal bones on her daily walks. 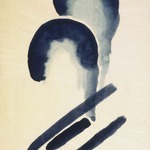 O'Keeffe said that, to her, bones did not signify death. Instead, they embodied the beauty of the desert landscape with their weathered surfaces, rough edges, and jagged openings. 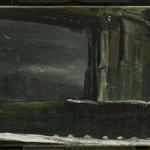 The NYC art scene was big in the 1940s, right? Mondrian, etc. 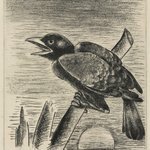 Any idea why Georgia O'Keeffe relocated to new Mexico in 1949? O'Keeffe had been been visiting New Mexico almost every summer since the 1920s, and she decided to move there after the death of her husband (photographer and gallery-owner Alfred Stieglitz) in 1946. She never thought of herself as a city-person to begin with, and truth to tell, she really never enjoyed living in New York very much! She was drawn to the open spaces and bold light and dramatic coloring of the Southwestern landscape -- and she eventually owned two homes there, where she lived and worked until the end of her life. 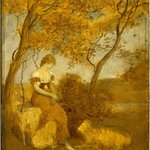 Did you see her painting of the "Ram's Head and White Hollyhock" in our galleries today? Yes! She designed that frame herself. 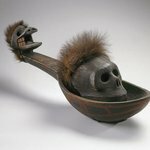 She would gather bones on her daily walks in the desert and paint them, sometimes in combination with other objects. 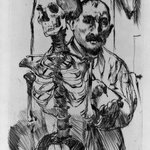 She said that she thought of the bones as still being very much alive! 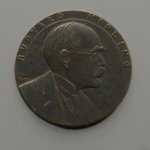 Can you tell us about this frame? Did O'Keeffe make her own frames? Georgia O'Keeffe did design the frame in this case. She is known to have done this only a few times. 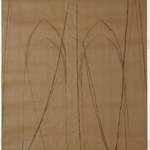 O'Keeffe may have been inspired by other artists from her circle who designed their own frames on a more regular basis. 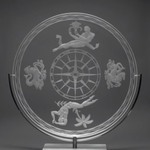 The frame here definitley adds a different dimension to the work. The scallops echo the clouds and really make the painting "pop," in my opinion! What do you think about it? I see. Didn't know that! Great to see it with its original frame. I love when artists do that. I do too! It changes the whole feel of the work and makes the viewing experience more complete. What is the metaphor of flower and skull together? The combination of the skull and flower here might not have a metaphorical meaning. 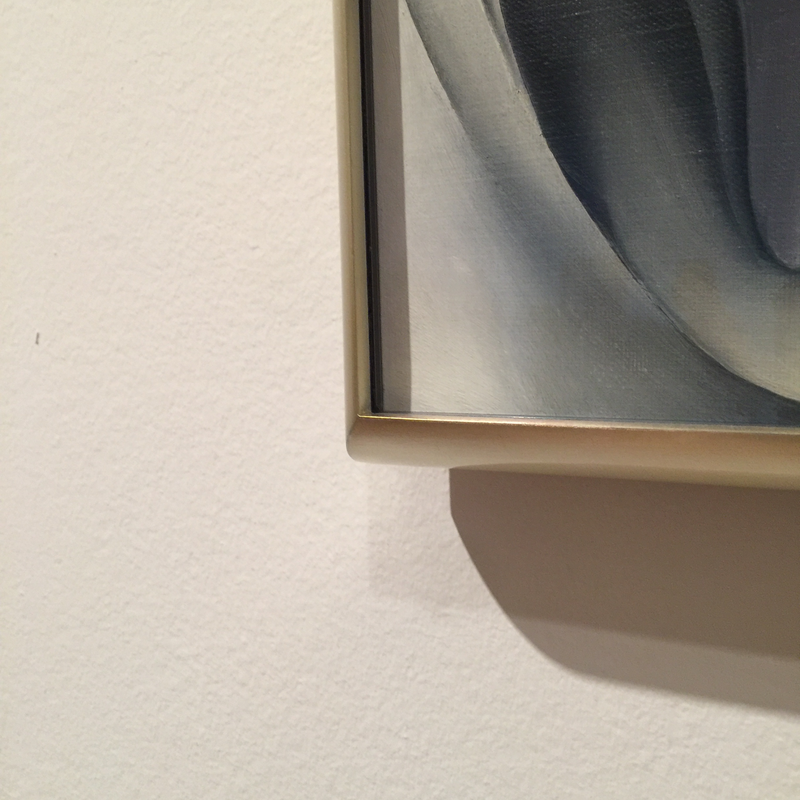 Many of O'Keeffe's paintings involved a combination of objects that reflected the landscape she was living in. 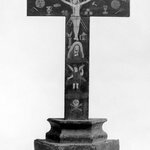 She would collect the bones while walking around the Southwest and, when this work was painted, take them back to New York. She liked painting bones because of their shape. The flower, hollyhock, was one that O'Keeffe picked from a garden at Ghost Ranch. O'Keeffe has said, "The first year I was out here [New Mexico], because there were no flowers, I began picking up bones. Well, if I wanted to take something home, I wanted to take something home to work on." Those curves fit into her general aesthetic of using simplified geometric forms. In this painting they seem to echo the forms of the clouds and rolling hills, plus the petals of that white rose! This is a wonderful example of the work O'Keeffe produced after encountering the landscape of New Mexico. O'Keeffe was inspired by shapes and colors of the landscape in the American Southwest, after years of living in the New York area. While exploring, she would pick up animal bones that were scattered around the desert. The way the skull hovers over the landscape really evokes the idea of the desert to me. How about you? It really is! 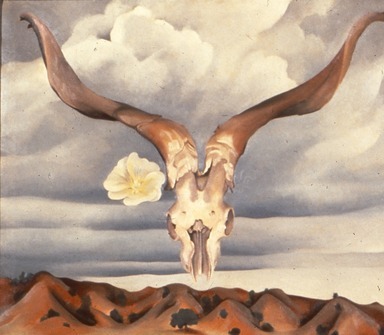 O'Keeffe was drawn to bones because of their shape, in a similar fashion to how she saw flowers in the Northeast. From across the room, I thought "Dali," which no doubt demonstrates my complete ignorance! You may be the first visitor to mention the Dali comparison, but I totally see it! A skull floating in the sky above a deserted landscape. When you get close you can see the signature O'Keeffe style though! She once said, I"I was in a surrealist show when I'd never heard of surrealism." 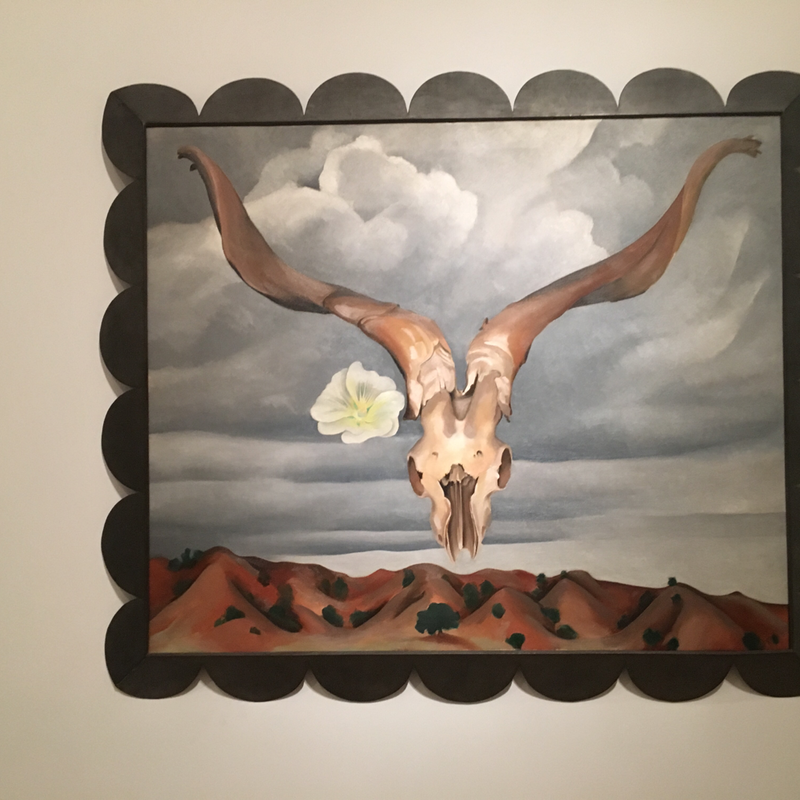 As you may have noticed, O'Keeffe loved to paint skulls, flowers, clouds, and desert landscapes...and here she put them all together! 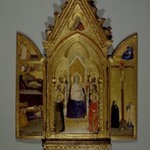 She even designed this frame especially for this painting. Why did she choose to paint this? 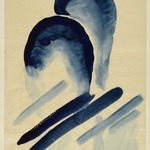 This painting brings together a few of O'Keeffe's favorite motifs. 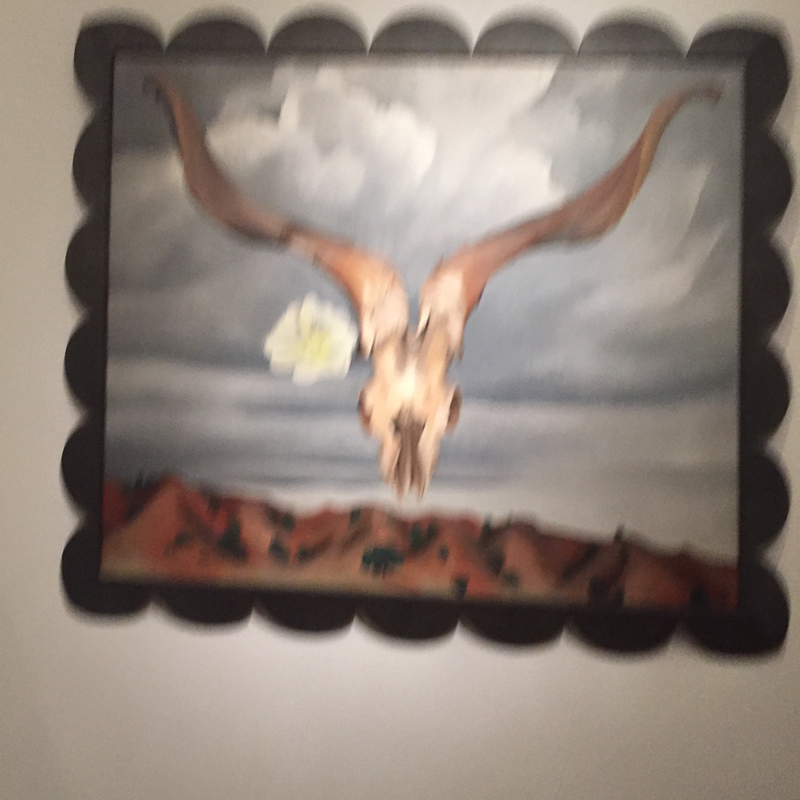 You may have noticed throughout the show that she painted many skulls, flowers, New Mexico landscapes, and clouds. 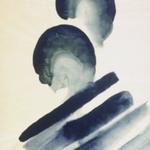 Overall, O'Keeffe was always inspired by nature and her surroundings. When she painted this she was living in New Mexico and spending a great deal of time in the desert. 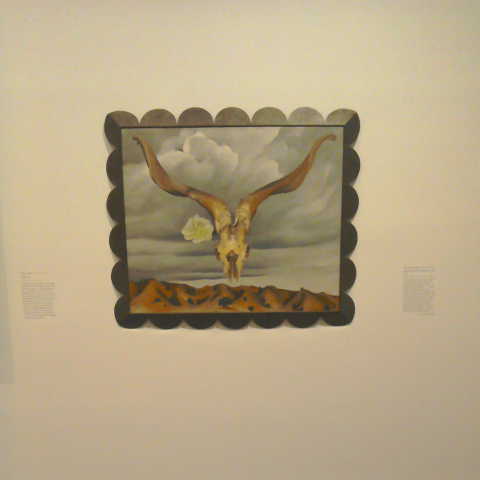 Was O'Keeffe living in New Mexico when she painted this? 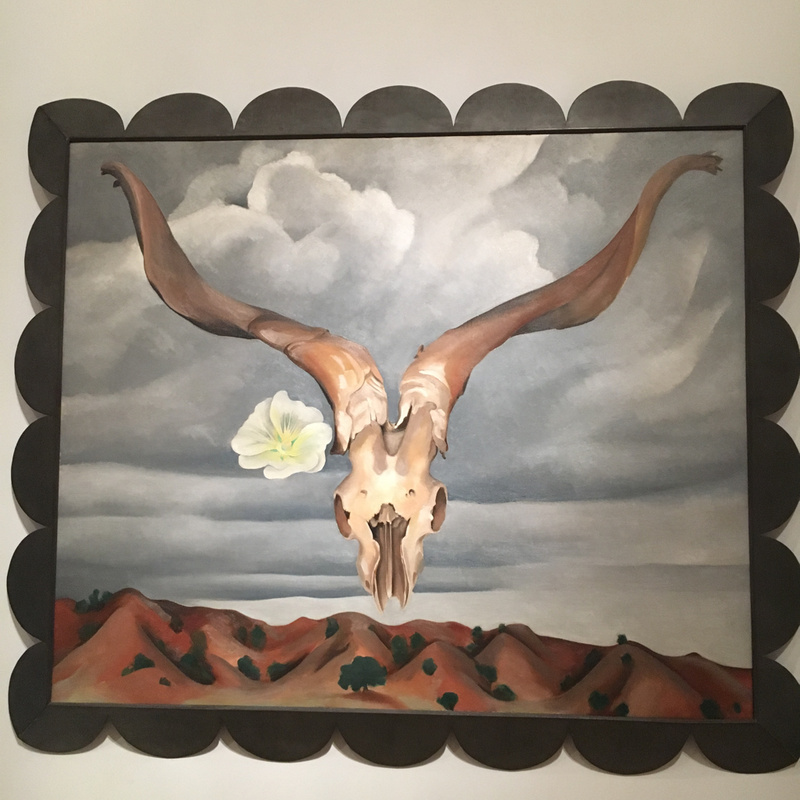 This painting dates from the time when O'Keeffe was enamored with the Southwest but still spending time in New York. The flower is a great callback to her earlier works and is one that grew in New Mexico. I just love how the skull floats over the landscape. 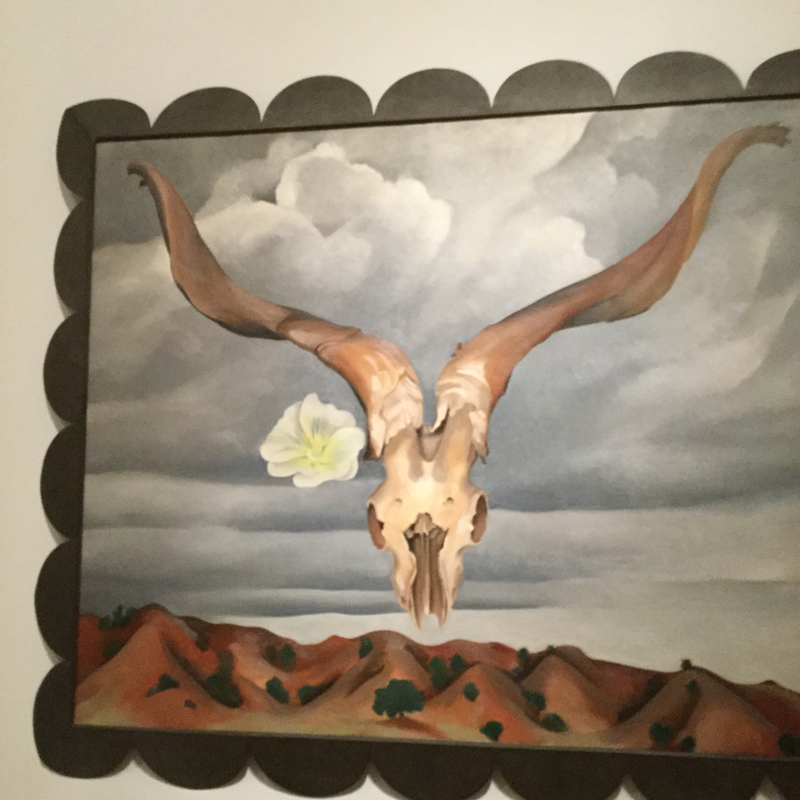 O'Keeffe was drawn to bones because of their shape. She often collected objects while exploring the landscape. Bones were scattered about the desert and she would bring them to her studio. The bones are really interesting. And she brings them to life. 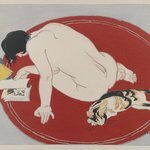 Is the metallic frame a choice of hers or was it added by a previous owner? 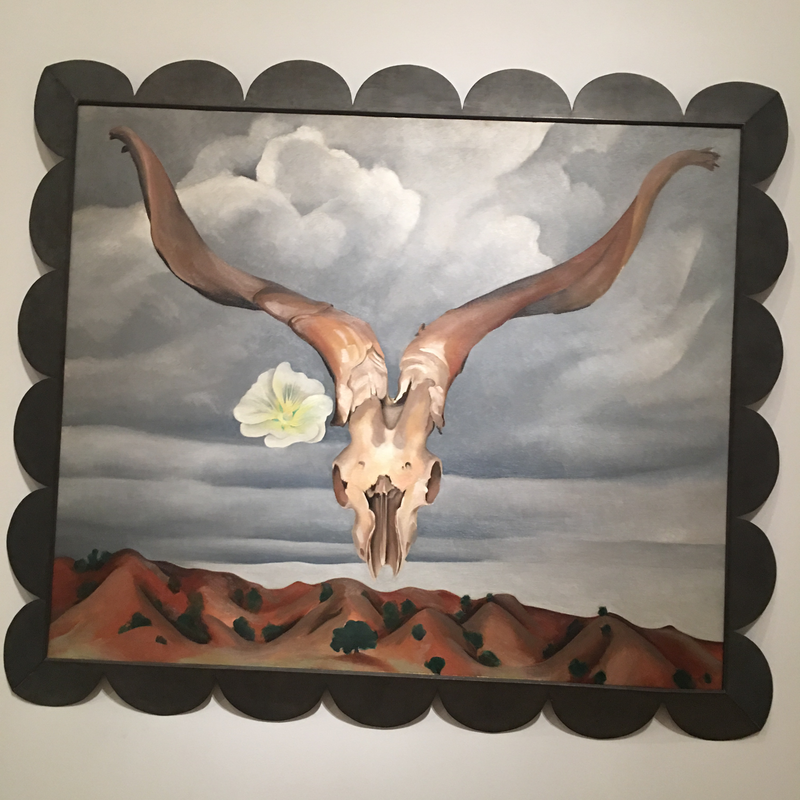 O'Keeffe sometimes designed frames for her own paintings, like this one! The scalloped edge pairs nicely with the shapes in the landscape. Did she explain her liking of ram skulls? 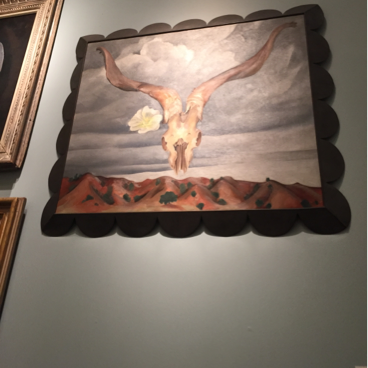 The skulls were very closely linked to her admiration of the New Mexico landscape. The animals, the hills, the weather conditions and sky were all part of the landscape that called "my country." These hills were the view from her desert ranch. Thank you. Did she hunt? She did have guns at her ranch. We have descriptions of her killing rattlesnakes! 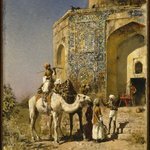 Can you tell me more about the subjects in this painting? This is "Ram's Head, White Hollyhock---Hills". 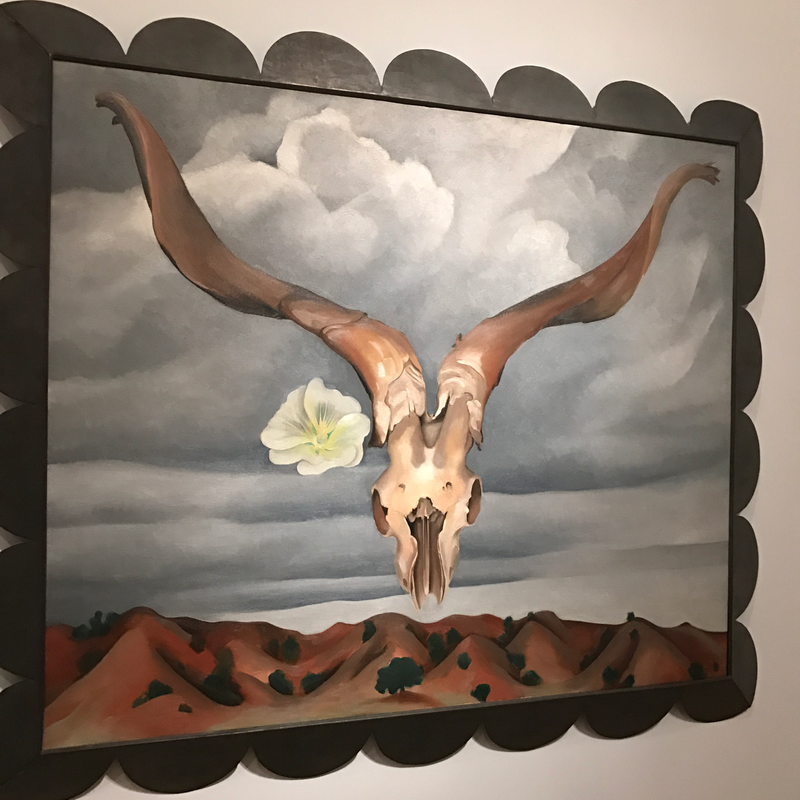 It features several of O'Keeffe's main motifs: the New Mexican landscape, where she spent summers and the latter half of her life; bones, which she would collect in the desert; and flowers. The flower here, the hollyhock, was actually a plant that grew in O'Keeffe's garden in New Mexico. 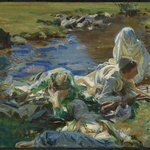 She was often inspired by the environment around her, both the landscapes and objects she would find in it. She also designed the frame for this piece herself! This one looks so much like a photograph. And, still with her signature floating flower. 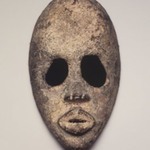 That piece is actually part of the Brooklyn Museum's permanent collection! 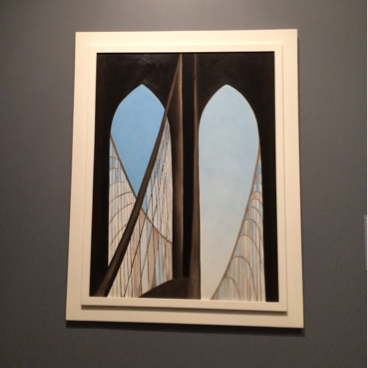 And the frame was designed by O'Keeffe. 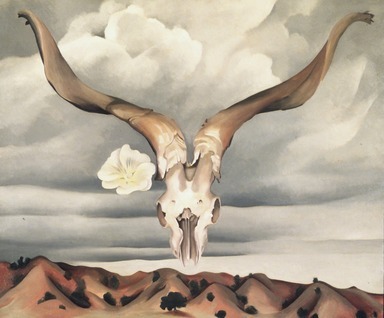 It includes so many of O'Keeffe's favorite images: the flower, of course, the skull, the clouds, and the hills! From far away, I couldn't tell it was oil. I almost wanted to touch and feel it. 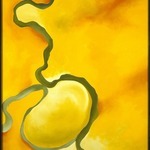 Her paintings do have a remarkably velvety quality. 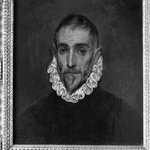 I'm a framer and I have never seen these frames. I was wondering if she had a particular framer? 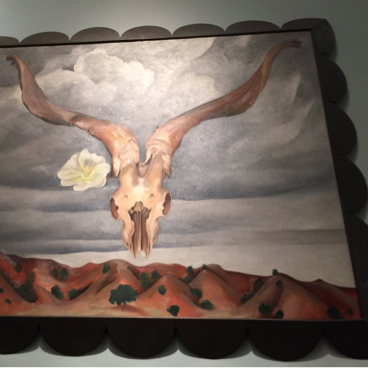 O'Keeffe designed the frame for "Ram's Head, White Hollyhock" herself! 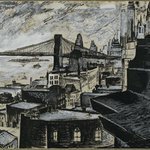 When she was in New York, she worked with a framemaker named George Of who frequently collaborated with artists at Alfred Stieglitz's galleries. 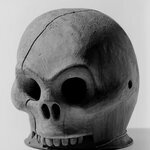 Why did O'Keeffe use bones in her art? 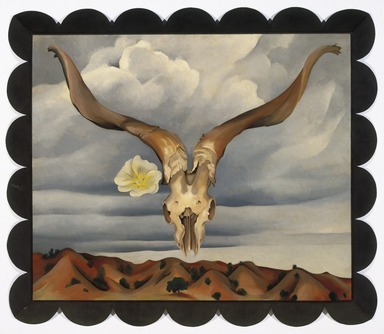 O'Keeffe began collecting bones, and using them in her paintings, when she first visited New Mexico. She found them visually interesting and she liked the organic shapes. 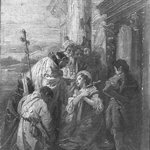 She said about the bones, " The bones do not symbolize death to me. They are shapes that I enjoy. It never occurs to me that they have anything to do with death. They're very lively. 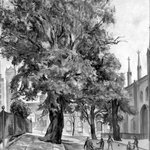 . . .They please me, and I have enjoyed them very much in relation to the sky." What do you think about the flower in this painting? Definitely one of my favorites in the exhibit. 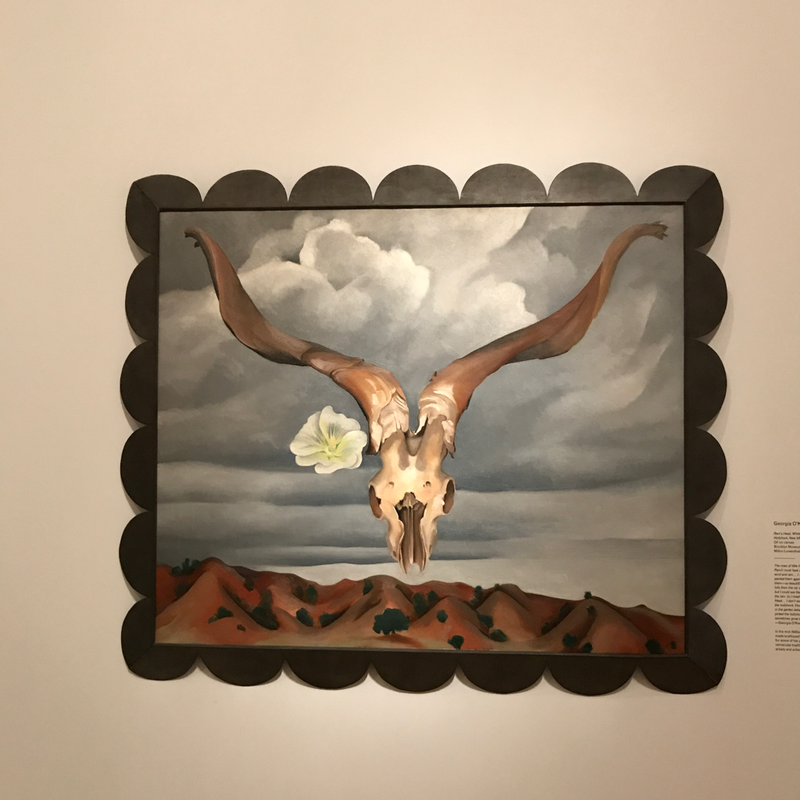 All of the elements of this painting were inspired by real New Mexican landscapes and objects O'Keeffe would encounter on her many strolls through the desert. 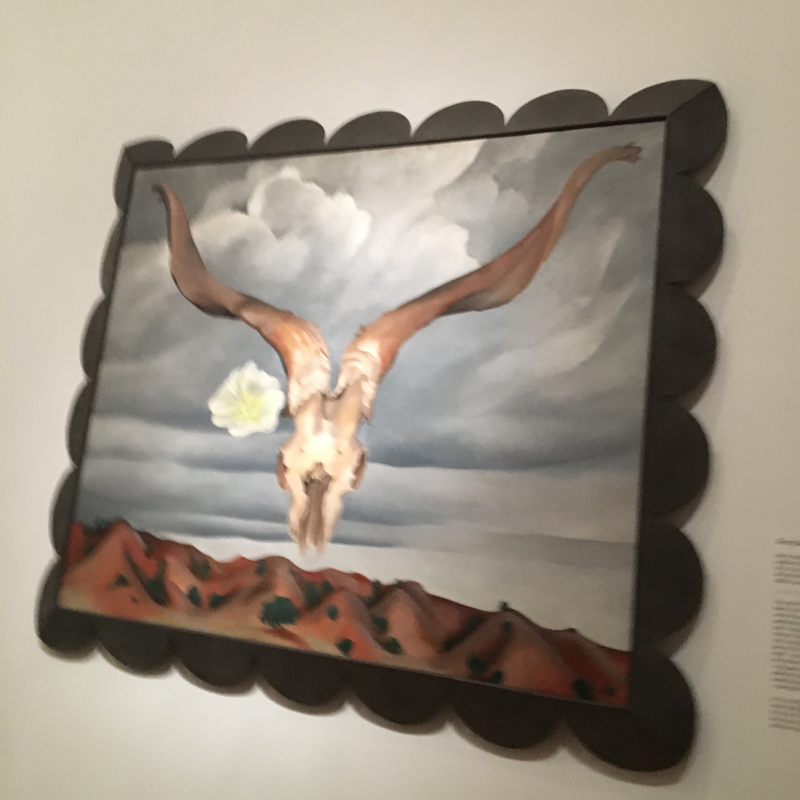 Those "Red Hills" in the background, for example were a landscape that O'Keeffe would come back to in here work over and over again and they were an actual place in the landscape that you could visit. 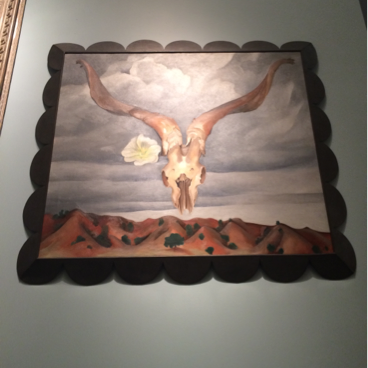 But then there is just a flower floating beside the skull/horns. Were flowers like this found in the area as well or is it an element that is borrowed from something else in her life? The ram's head she collected on one of her walks and the hollyhock flower was growing in her vegetable garden! 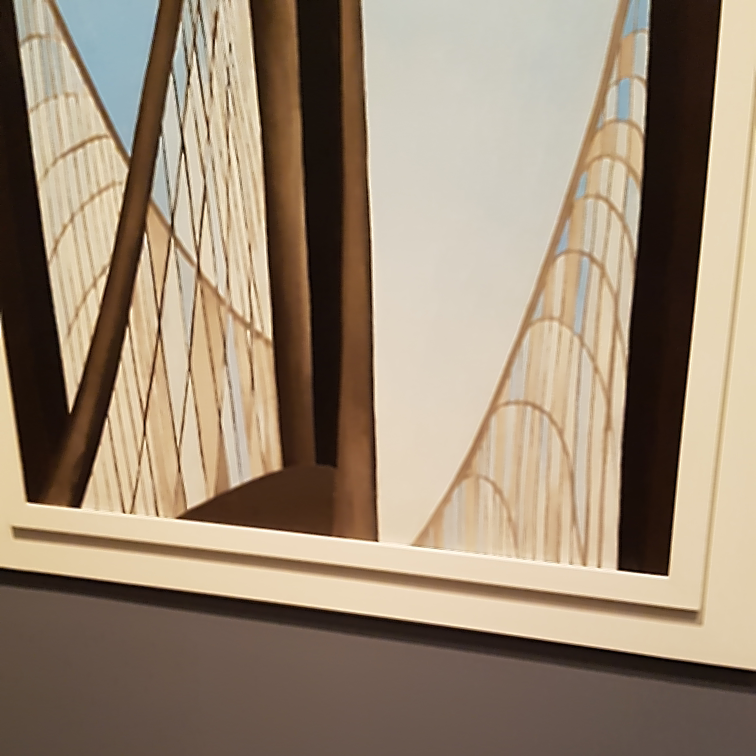 I can see the similarities, but I don't think that O'Keeffe took a lot of influence from other artists at this point in her career. 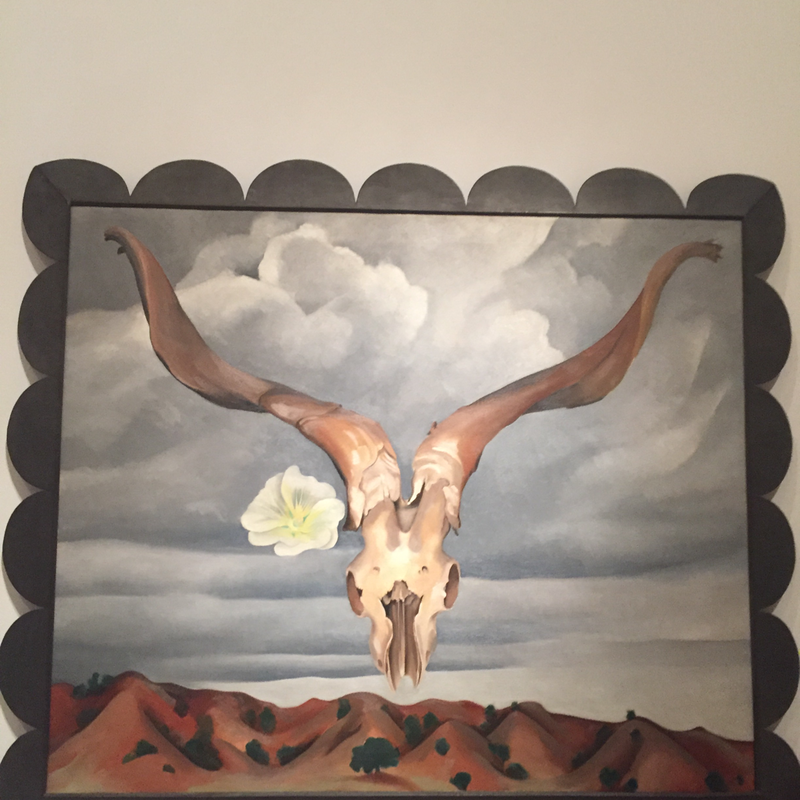 In fact, Dali didn't paint a lot of objects floating in the sky until the 1950s, decades after this work by O'Keeffe. The red hills in the background were a landscape in New Mexico near her ranch that she visited and painted over and over again. The skull was collected during many of her walks in the desert and the flower she picked from her garden. 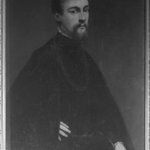 Though pasted together, the individual elements of the painting are rooted in reality. Why are the horns so big? They are actually true to real-life proportions, in relation to the skull, but they do look large in comparison to the hills below. 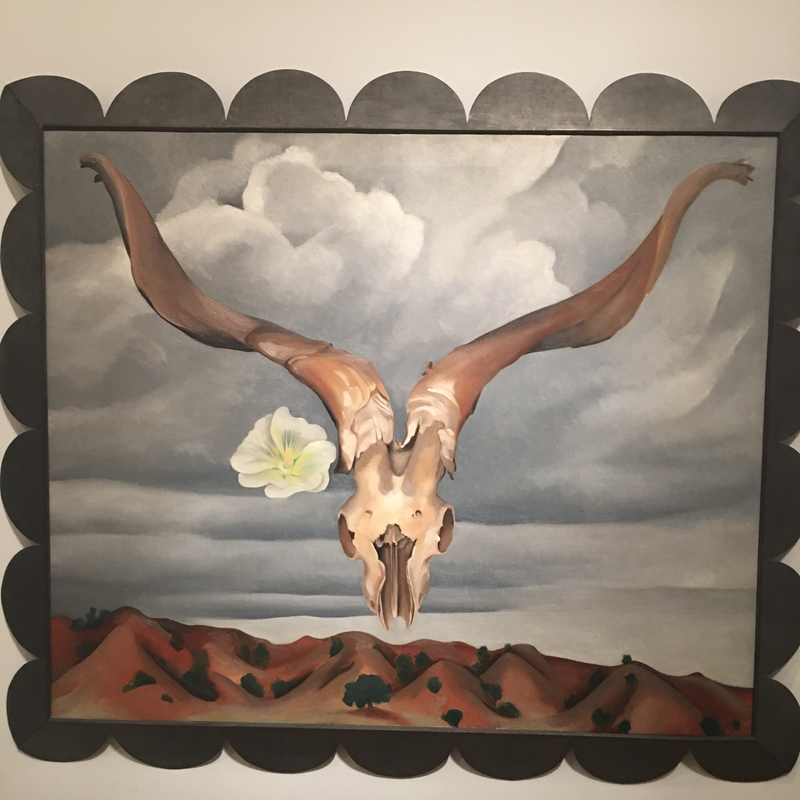 O'Keeffe went for walks in the desert and collected bones that she took home to her ranch and used them as props in the studio. 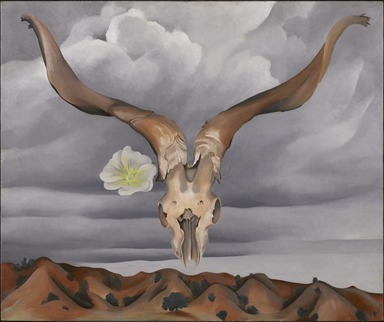 This painting incorporates some of O'Keeffe's most iconic imagery: the bleached bones she collected in the desert, the desert itself, and a flower. 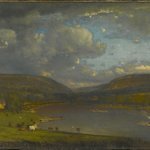 She began painting all these subjects while still living in New York, when she would bring the objects she collected in New Mexico back to her studio in the city to paint. 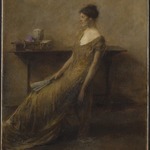 This painting was made during the time when she still lived in New York, but periodically visited New Mexico. 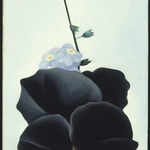 O'Keeffe has commented on this painting saying that the composition "just sort of grew together." 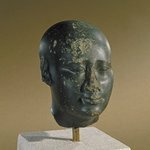 She had collected the rams head skull from one of her walks in the desert and the white hollyhock flower from among the vegetables in her garden. One of her beloved New Mexico landscapes provides the background. 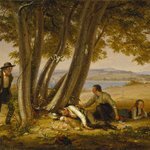 This painting is a little different. Yes! 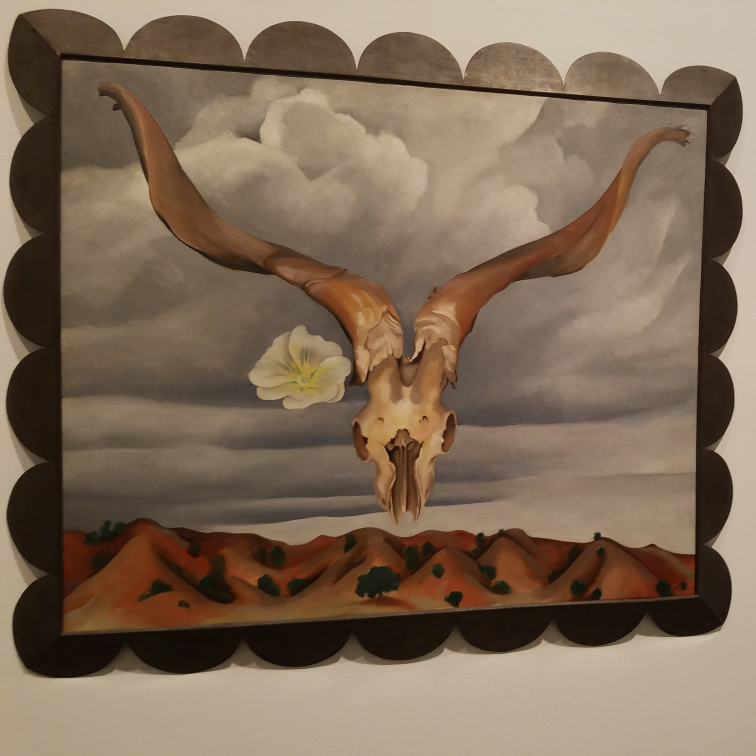 It's a departure from O'Keeffe's other work, neither a still life nor a landscape, but a combination of the two genres.. She collected the skull on one of her many walks throughout the desert, the flower was picked from her garden, and the red hills could be seen from her home. In "Ram's Head, White Hollyhock Hills" you can really see how O'Keeffe began to collect a list of subjects that she was interested in painting, from the bleached bones of the desert to her signature flowers and the desert itself. 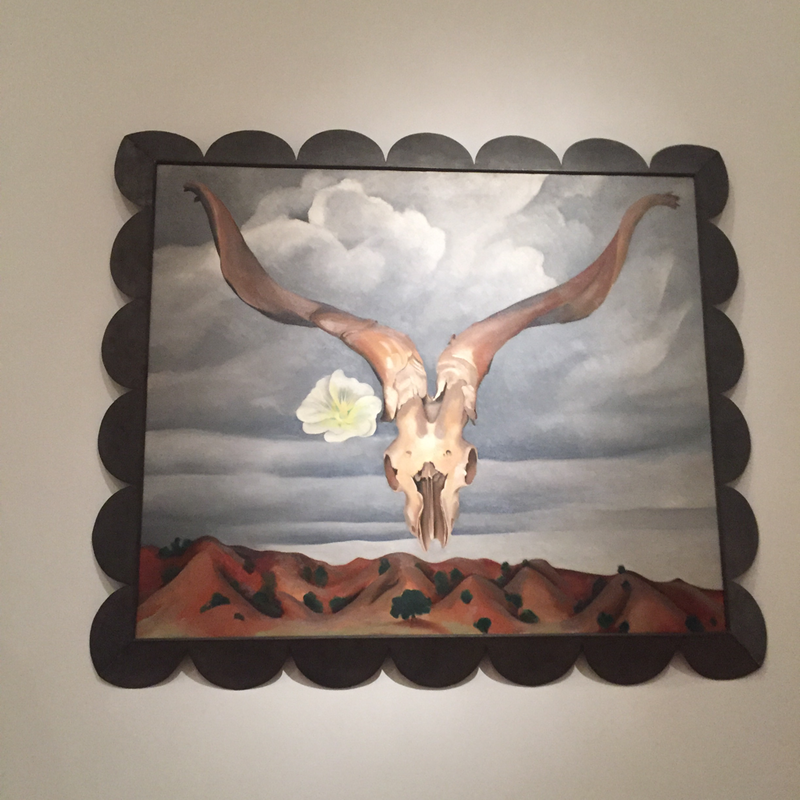 The frame was also designed by O'Keeffe to go with this painting. You can see how the scalloped edge mirrors the shapes of the clouds in the sky. 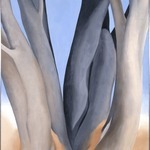 Would you say O'Keeffe was influenced by surrealism? She was certainly aware of surrealism, but I'm not sure how much it influenced her art. 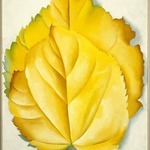 Most works by O'Keeffe---even her abstract canvases---are rooted in the natural world. 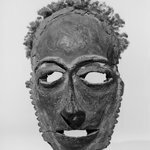 In one interview with Katherine Kuh, she said, "I was in the surrealist show when I'd never heard of surrealism. I'm not a joiner." By the 1940s, I'm sure she was aware of certain Surrealist exhibitions being held in New York. 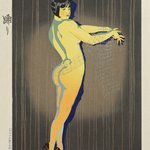 However, she'd begun working in this style by the 1920s, playing with scale and space and cropping. 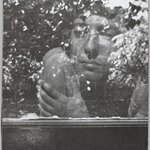 She was more directly influenced by photography, like the work of Stieglitz, Paul Strand, and Imogen Cunningham, to name just a few. And once she started visiting New Mexico, she was strongly affected by the different ways of seeing she gained there --- due to the new perspectives of such wide vast distances. 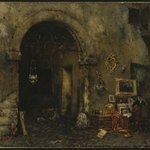 I also like thinking about the relationship between these paintings and the clothing and the objects she used to decorate her home. Her life as a total work of art! 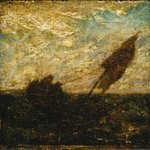 Could you please tell me more about this painting? 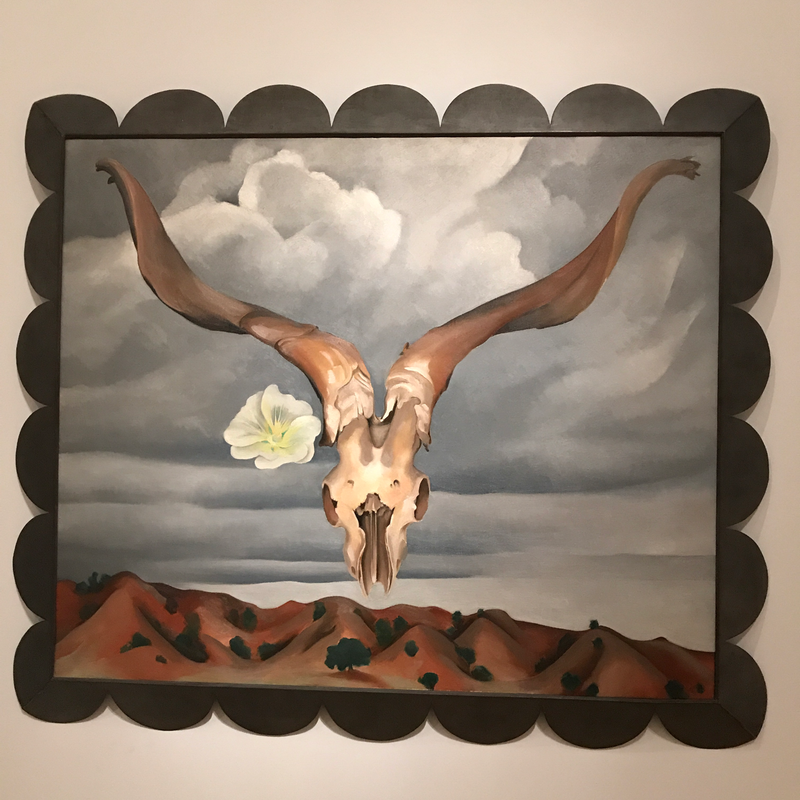 This painting brings together a few of O'Keeffe's favorite subjects: desert bones, flowers, clouds, and the New Mexico landscape. She even designed this frame specially to complement the rolling hills! 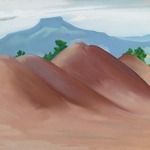 The rows of little hills under the Ram’s Head at Ghost Ranch must have been formed by thousands of years of wind and rain.… I had looked out on the hills for weeks and painted them again and again—had climbed and ridden over them—so beautifully soft, so difficult.… I had painted those hills from the car in bright sunlight and had failed dismally but I could see them—farther away—from my window in the rain. So I tried again. They seemed right with the Ram’s Head.… I don’t remember where I picked up the head—or the hollyhock. Flowers were planted among the vegetables in the garden between the house and the hills and I probably picked the hollyhock one day as I walked past. My paintings sometimes grow by pieces from what is around. 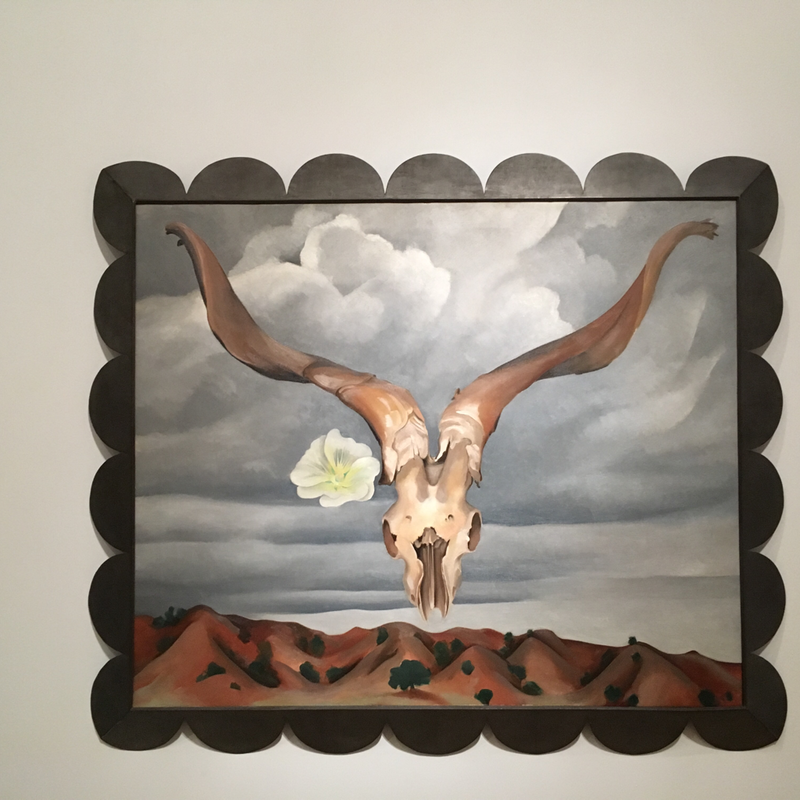 In the mid-1930s, O’Keeffe’s frame maker George Of made scalloped and punched sheet metal frames for some of her paintings. These were inspired by vernacular traditions in tin ware made by Hispanic artists and artisans in the Southwest.